Many patients have questions when it comes to fat reduction techniques. At Pretty Faces Atlanta, we perform two popular procedures: TruSculpt ID and VASER® Liposuction, also known as VaserLipo. The question becomes, which procedure is right for you? The answer is, it depends on your preference of minimally invasive versus non invasive technology to achieve your desired results. Bra rolls, back fat, love handles and more will melt away with the minimally invasive VASER liposuction procedure. VaserLipo melts fat via an ultrasound probe, leaving surrounding tissue (such as nerves, blood vessels and connective tissue) relatively intact. The liquefied fat is then removed through our gentle suctioning process, through which damage to surrounding tissue is further reduced. This procedure is successful with all body types and body weights, with smooth, predictable results, fast recovery and minimal downtime. Even though this is a minimally invasive procedure, with VaserLipo, you will be awake for the entire procedure, with controlled pain management. The results experienced with this procedure will be visible faster than if you choose a noninvasive procedure for fat loss. However, we understand there are some patients who want to experience a body sculpt transformation, yet are reluctant to undergo a treatment with any level of invasiveness. In response to this, we also offer a noninvasive option. TruSculpt is an incredible non-invasive technology clinically proven to eliminate up to 24% of the fat in the area in one 15-minute treatment, and causes significant skin tightening WITHOUT surgery. It is not as dramatic as VaserLipo but still very effective. 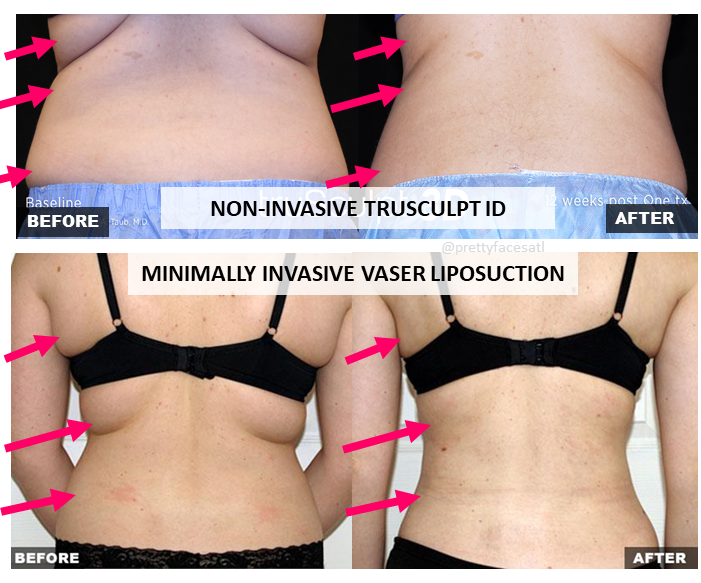 As an estimate, it would probably take 2 to 3 sessions with truSculpt to achieve the same results as Liposuction. What do we mean by non-invasive? Non-invasive means no scalpels, no scars, and no incisions from this treatment. The treatment includes be a hands-free or handheld option; the method used is dependent upon the location we are treating. For example, if you are looking to lose the “turkey arm” fat or “double chin” we will use the hand held device in order to accurately target the area. If you are looking to eliminate fat in the abdomen, we will use the hands free option. Leg areas, flanks (love handles) and other areas can be treated as well! Watch a LIVE truSculpt3D procedure, where we glide the hand-held device over the mapped out flanks area for 15 minutes. If you're doing the flanks, we'll do once on each side. TruSculpt is clinically proven to permanently eliminate fat cells in stubborn areas that have been RESISTANT to diet and exercise. Safe for all skin types and can be used on various areas of the body. Sculpt the body definition you want! As you can see, each method used will produce results. Contact Pretty Faces Atlanta for a consultation to discuss the best treatment option for you. We will assess your body goals to determine the best procedure to achieve optimal results.